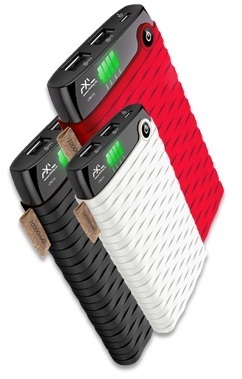 AXL brings Li-Polymer Power Bank LPB110 with half the weight and double the life! NEW DELHI, India – June 29, 2015 – AXL, the smart-life accessories brand has launched its one of a kind 10000mAh power bank LPB110 in the market that runs on Li-polymer cells and has double the charge-cycle of an ordinary power bank. The power bank weighs just 235 grams and comes in red, white and black colors. The LPB110 also has a fire-resistant body, as a safety feature, and LED indicator for ease of use. It can charge two devices simultaneously, even when the power bank is charging itself, with 2.1A of maximum output for faster charging. AXL LPB110 power bank has a MRP of Rs. 2,999/- and is available in all stores across India in ex-stock. Incorporated in 2015, AXL World is a promising lifestyle gadgets maker. Being a brand launched by Modi Infosol a veteran distributor of IT brands in India, AXL has a huge in-built advantage of over 28 years of IT distribution. AXL benefits from the systematic feedback mechanisms to feel the pulse of the customers, besides enjoying the loyal partnership with established channel partners over the years. Currently AXL has launched OTG devices and power banks. AXL has aggressive plans of launching an array of other products which enhance mobile experience. Mumbai, India – June 29, 2015 – Creative Peripherals, one of India’s leading distribution network in IT, Imaging, Telecom and Lifestyle products, has been appointed as national distributor by Targus Group, the world’s leading premium accessories maker. This tie-up will help Targus in reinforcing their store presence across cities in India. With a remarkable Online/LFR presence, Creative Peripherals want to be the No. 1 distributor for Targus in India. With offerings like well-known laptop bags, notebook cases, tablet accessories, telecom accessories along with corporate product range such as Universal Docking station/Privacy screen and Lock, the distribution agency has engaged its top-level executives to focus on bundling of Targus products with prominent gadgets in the market. Creative Peripherals will provide strong partnership at retail and IT channels. Consumers will have availabiity, quick service and choice of products with this tie-up. It is a big step in Targus’s plan to grow in India as more and more products will see the shelf. As the pioneer in notebook computer carrying cases, Targus has maintained its leadership position by offering a full range of products to meet the needs of today’s mobile consumer. Targus’ strategic acquisitions have expanded its suite of brands to include PORT notebook computer carrying cases, CD Projects digital music and video accessories, Glacier Gear soft-sided coolers, and RakGear ergonomic Backpack. In addition, Targus has allied with the leading technology companies to market and distribute state-of-the-art PDA peripherals and security and connectivity devices, such as the award-winning Stowaway Portable Keyboard. Incorporated in 1992, Creative Peripherals & Distribution Pvt. Ltd. has successfully achieved the status of being a focused player in Distribution of I.T. as well as non I.T. products like telecom and CE products with a significant reach across India.Currently having a family of more than 175 employees and more than 3000 channel partners, CPDPL is the leading distribution network in India for IT, Imaging, Telecom and Lifestyle brands. MUMBAI, India – June 29, 2015 – Swan Solutions, a leading provider of end-to-end information technology solutions, today announced the implementation of unified management solution at a leading manufacturing company. The USD 2 billion engineering conglomerate is a pioneer in designing, manufacturing and marketing products related to power generation, transmission and distribution (T&D). With the new deployment, its management can now easily handle its network infrastructure spread across various countries and be assured of business continuity with a single-point network monitoring. The manufacturing company wanted to upgrade its network infrastructure to meet an increasing demand for scalability, performance and reliability. The previous solution didn’t allow a single-point network monitoring, and switches could not be remotely controlled. Its management required a unified management solution to handle its network infrastructure. It also desired higher network redundancy and business continuity. In order to maintain its leadership position in the industry, the manufacturing company turned to Swan Solutions for a highly scalable solution that could manage its network infrastructure across countries. Swan Solutions provided a network management platform solution – HP Intelligent Management Center (IMC) Enterprise Software Platform – which monitors the company’s network proactively and also helps to mitigate risk. It enables efficient implementation of end-to-end business management, while the software’s modularity allows for integration of traditionally separate management tools. IMC provides complete management of resources, services and users. Swan Solutions installed and configured HP 5500 EI and EL Switch Series which deliver outstanding security, multi-layer reliability and multi-service support capabilities. The solution package also includes installing and configuring HP 5120 EI Switches in DMZ zones for connecting servers to the data center, HP 5500 SFP Switch for WAN connections for all campus-wide access switches to terminate, and configuring various L3 routes on HP 5500 Switch. Additionally, Swan Solutions implemented N: 1 virtualization technology at the manufacturing company. This created a logical switch by grouping several switches and an Intelligent Resilient Framework (IRF) stack which can support 2 to 10 switches at a time. All the switches in the IRF stack are managed as one network entity using one IP address by managing the logical switch, distributed routing and switching. The solution also supports In-Service Software Upgrade (ISSU) for minimal downtime during software upgrades. Swan Solutions further customized this solution by configuring various alerts and threshold to monitor the network. Swan is a professionally managed company with a qualified management and technical team providing end-to-end Information Technology solutions for medium and large business enterprises. Over two decades, Swan has built a loyal client base that relies on us for providing and managing their information technology solutions. Associating with the best in IT majors in India and abroad; we strive to bring the best-of-breed solutions that meet the immediate and future needs of our clients. Know more. You are currently browsing the CHANGE AGENTS PR blog archives for the day Monday, June 29th, 2015.